This is not the one about Fifth Third stacking overdraft fees. 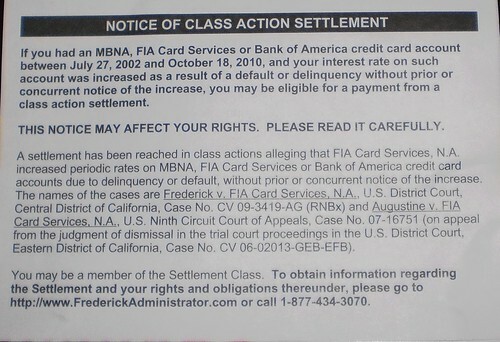 This is about Bank of America, MBNA or FIA Card Services credit cards. I had a Bank of American credit card during the years in question and wow, that's 8 years they are claiming. I do remember getting my rate jacked up when the stamp fell off my payment and it had to be returned to me. That month, the payment was late. I paid it, but it was about 5 days late. I guess I better check out this web site and see what they are proposing as a settlement. Unfortunately, I don't remember the month or year this happened, some time in 2009, I think. But this causes me to wonder. With the banking crisis that precipitated the recession, how many more of these kinds of postcards am I going to get? What other malfeasance is going to come out in 3-4 years that will net consumers money in the end? Yes, it's very good that this was caught, although BoA is, of course, not admitting they did anything wrong. It's too much to ask, I guess, that an institution treat people as it expects us to treat them, fairly. I don't know if more regulation is needed but I do know that while getting a lump sum later is all well and good, I'd rather have my money the first time and not lining someone's pocket.